NEW YORK (CNS) — Parents be warned: Your kids will want a robot for Christmas. This time, it’s Baymax (voice of Scott Adsit), an inflatable vinyl robot designed by a college student, Tadashi (voice of Daniel Henney), to be a “Personal Health Care Companion.” In other words, Baymax is to serve as both nurse and nanny for Tadashi’s troublesome younger brother, Hiro (voice of Ryan Potter). Unlike Mary Poppins, Baymax is short on words and discipline. Instead, this distant cousin of the Marshmallow Man offers warm, squishy hugs and a playful demeanor — and steals the movie. 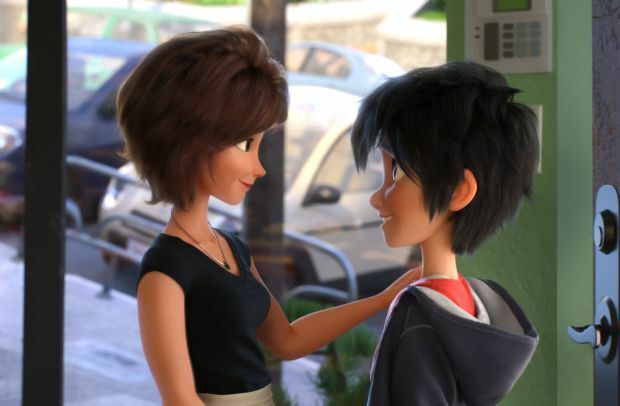 Unfortunately, the rest of “Big Hero 6” is less inventive and follows a familiar playbook. That’s not especially surprising given that the film is loosely based on a Marvel Comics series. The setting is the city of “San Fransokyo,” a mash-up — as its name obviously suggests — of San Francisco and Tokyo: think cable cars and cherry blossoms. Tadashi and Hiro are orphans (a Disney standard), raised by their sassy Aunt Cass (voice of Maya Rudolph). They share a passion for robotics. After Tadashi dies in a lab explosion under mysterious circumstances, Hiro uncovers an evil conspiracy (naturally), and sets out to find the bad guys. Of course, Hiro needs backup. So Baymax gets a high-tech makeover, which turns him into a version of Iron Man. And an assortment of Tadashi’s college buddies are recruited for the adventure: cyclist GoGo Tomago (voice of Jamie Chung), beatnik Wasabi (voice of Damon Wayans Jr.), chemistry whiz Honey Lemon (voice of Genesis Rodriguez), and monster-loving Fred (voice of T.J. Miller). Superhero feats are not in their nature, however. “We’re nerds,” Wasabi protests. Directors Don Hall (“Winnie the Pooh”) and Chris Williams (“Bolt”) ramp up the action as “Big Hero 6” morphs into a version of “Revenge of the Nerds.” The film’s Marvel provenance is evident in noisy smash-bang sequences which may be too intense for younger viewers. Parents will appreciate the movie’s calmer moments which offer good lessons in friendship, self-sacrifice, and resisting temptation. Preceding “Big Hero 6” is “Feast,” a charming animated short directed by Patrick Osborne. It offers a dog’s-eye view of life, love, and the pursuit of happiness, one meal at a time. “Feast” is acceptable for all ages. The film contains mildly scary sequences, references to puberty and some slightly edgy humor. The Catholic News Service classification is A-II — adults and adolescents. The Motion Picture Association of America rating is PG — parental guidance suggested. Some material may not be suitable for children.